Holocaust and Human Behavior explores the history of the Weimar Republic in Germany, the rise of the Nazi Party during that era, and the Nazis’ assault on democracy during their first years in power. This history can help us reflect on the nature of democracy, itself, and what factors may sustain it or undermine it in any country and in any time period. Here are six educator resources from Holocaust and Human Behavior that can help your students explore democracy at risk. This list highlights the important characteristics of German society during the Weimar years that contributed to the decline of the republic. Video—Hitler’s Rise to Power: 1918 to 1933: What events and beliefs can help erode people’s trust in democracy and make it possible for an authoritarian leader to come to power? This video traces the rise of Adolf Hitler throughout the years of democracy in Germany and provides insight into how threats to democracy can arise from within the system itself. Rumors of Betrayal: Defeat, rumors and conspiracy theories fuel a "politics of resentment" that can undermine the legitimacy of whatever government, democratic or otherwise, that follows. Outlawing the Opposition: How can fears about safety and security be manipulated to weaken democracy? How can language be used to shape perceptions about the necessity to trade freedom for security? What role does political opposition play in a democracy? Storm Troopers, Elite Guards, and Secret Police: What are the dangers of paramilitary groups beholden to political parties rather than democratic governments? What effect does street violence have on a democratic society? Shaping Public Opinion: In what ways is it acceptable in a democracy for the government to seek to persuade the public? At what point does persuasion become manipulation? How important is accurate information and honest debate to a healthy democracy? Schooling for the National Community: How can schools help spread the values of a society or its government? What should children learn in school in order to support and sustain democracy? You can use these resources and more in our newly revised edition of Holocaust and Human Behavior to examine aspects of what makes a healthy democracy today. 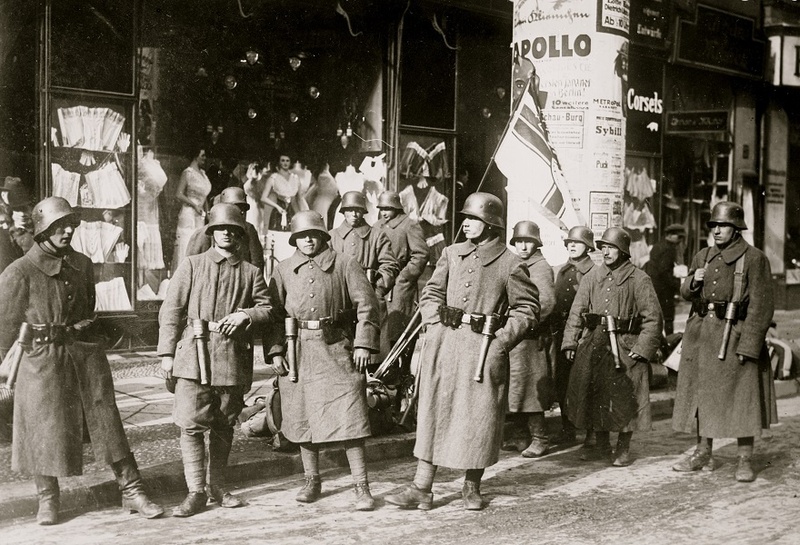 Photo Caption: Free Corps soldiers during their efforts to overthrow the Weimar government and restore the monarchy in an attempted coup known as the Kapp Putsch in March 1920.